The viewing of the fluffy bloom of pink and white cherry blossoms, those first colors of spring, has become an intrinsic part of being a Portlander. And the planning starts as early as December, sometimes even earlier. Amateur running, cycling and photography groups, social media officers, picnicking families, and many other Portlanders and visitors start planning their schedules around this very special time of the year. The Japanese even have a word, hanami, devoted to it. 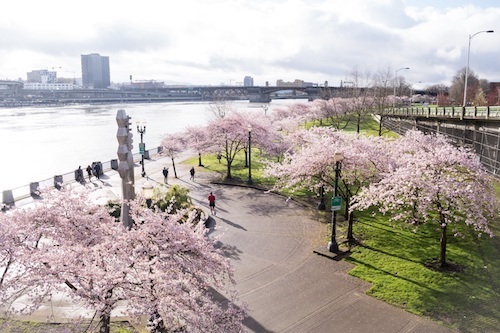 Portland trees are by and large lovely, but as spring appears, it announces its arrival in grand fashion by converting the cherry trees, and the riverfront they hug, into a spectacular pink and white showcase. The trees seem to preen and sigh. They seem to puff their chests out and to even blush and smile. They seem playful and joyous, and that joy translates across the entire city. Whether you’re a morning runner getting reinvigorated by its sight, a professional forgetting their work stress as they walk by, or the rest of the city’s millions who arrive ready with their Insta image composition already decided; each and every one of them is enriched by the cherry blossoms’ presence. Cherry blossoms are the flower of the genus Prunus. Typically associated with Japanese culture and history, cherry blossoms are widely spread across the temperate regions of the world. The cherry blossoms planted across the US are mostly gifts from the Japanese government, and various Japanese institutions and business houses. In Portland, the blooming cycle is typically in March and April, although each year, weather patterns might result in a delay by 2–3 weeks, resulting in a March end to May cycle. The most famous grove in the city is to be found north of Burnside, in Tom McCall Waterfront Park. These 100 Akebono trees were donated in 1990 by the Japanese Grain Importers Association. The trees are situated at the northern end of the park at the Japanese American Historical Plaza, a memorial to the 120,000 men, women and children who were held in internment against their will during World War II. The Albina area has some beautiful old trees planted in the 1950s and ’60s, although these are more scattered as quite a few have withered and been removed due to age. 60 more trees of the Shirofugen, a late flowering variety, can be found at the Hoyt Arboretum, a membership-based, non-profit organization working with Portland Parks and Recreation. The Shirofugen variety is said to have a fluffier appearance due to a “double-flower,” which gives it more petals. These would typically emerge between mid-April and May. Peak bloom is a specific day in the blooming period when 70 percent of the cherry blossom flowers have opened up. It’s relevant if you’re planning a visit, although the beauty of the cherry blossoms can be enjoyed any time in the 4–5 days before and after peak bloom. Peak bloom is decided after careful assessment of a number of factors, including prevailing and forecasted weather conditions, historical data, and close observation. It is worth keeping in mind that peak bloom predictions can vary, hence plans to visit from afar should be flexible. The most accurate predictions can be made roughly 10–12 days out. While most varieties of cherry blossoms are pink and white, there could also be dark pink, yellow, and sometimes even green flowers. The Historical Plaza, Japanese Garden, and Hoyt Arboretum usually post regular updates on the expected dates of the blooming period and can be contacted for additional information. Alternatively, one could head to Instagram and wait for the pictures to start making their way into their feed! As a ritual, the hanami, or the viewing of the flowers, is a solemn occasion, where the Japanese contemplate the ephemerality of life and its gifts. It is in the very same vein also a celebration, where one cherishes life and nature through the fleeting existence of the cherry blossoms. Cherry trees and their radiant blossoms remind us of a deeper truth behind their beauty. Every single tree on earth is beautiful and needs nourishment, care, and love. Portland and its residents have always had a rich, deep connection with nature, and from a young age are deeply aware of the importance of Portland’s trees in protecting the environment. Regular maintenance of trees to increase their lifespan are vital topics to be educated on, as a citizen and as an administrator. Professional maintenance services, like Mr. Tree, play a valuable role in conservation and safety in commercial and residential areas. As more and more cities around the world blindly uproot and destroy these life-sustaining beauties in the name of progress and development, it becomes even more important to set a global standard. The cherry blossom and other beautiful flowering trees and plants delight our visual sense in the brief time that they bloom, but each tree on the planet is nourishing us every second of every day. It is vital that we remember that and nurture them for generations to come.